Vegetable soup happened today. I was all systematic and stuff (which is NOT like me) and had my grocery list organized by aisle thanks to our store’s mobile app. I got home and threw all the ingredients in the crock pot and went about my day. 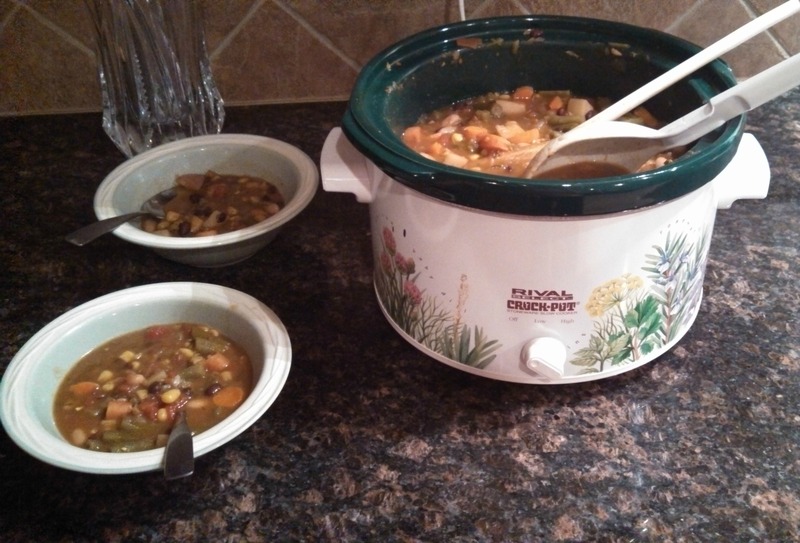 Sidenote: my crock pot was a wedding gift so it is a smidgen less than 15 years old. It works fine but is a bit smaller than I would like. And is as bare bones as it gets. Low and High are your only options. Is it a terrible sign of getting old that I would really like to receive a new crock pot for any random gift giving occasion that you might be struggling with for moi? That is all. Anywho, it turned out really yummy and was as easy as it gets for this non-cook. I’m posting the recipe I used here because I will lose the link otherwise and never find it again. Note: To make this a meat dish, simply add 1 pound chicken fillets (cut into 1″ cubes) to slow cooker along with the other ingredients.